Oliver cooked me a bacon and egg sandwich and then drove me back to the sea wall leading from Cardiff to Newport. What a great brother I’ve got! The weather was very changeable today, bright sunshine interspersed with heavy showers. I survived 3 such showers without getting wet. The first came after only 5 minutes of walking and I was just by a cafe so I ran inside and had a coffee. 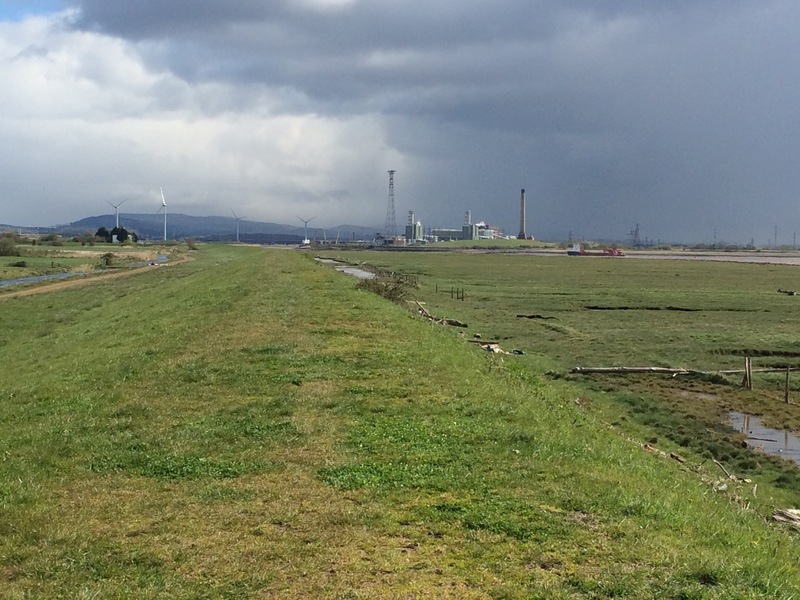 walking the sea wall – ominous dark clouds over Newport Power Station! The sea wall reminded me of Essex and the low lying land with ditches was rather like the Norfolk Fens; there even seem to be a smattering of Dutch names! 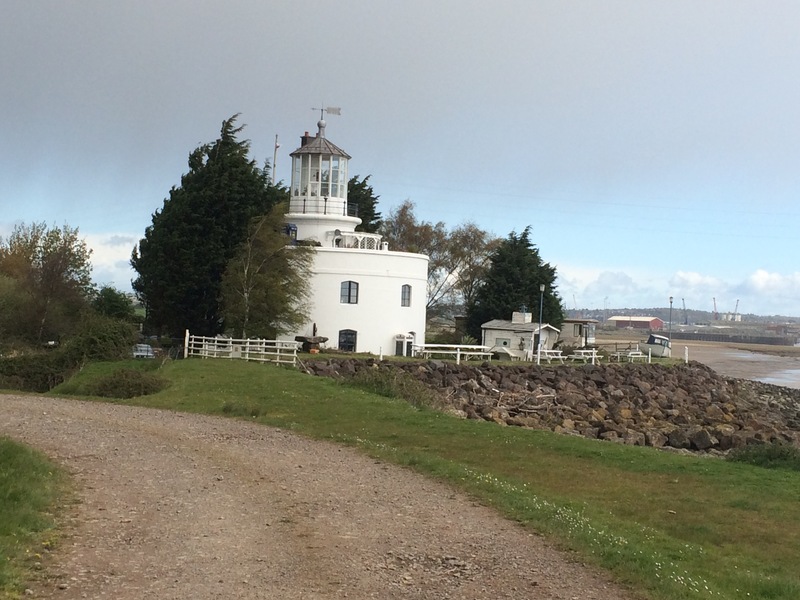 West Usk lighthouse marked the turn inland up the Ebbw River. I had to run to the lighthouse and take cover behind a wall from the second downpour. 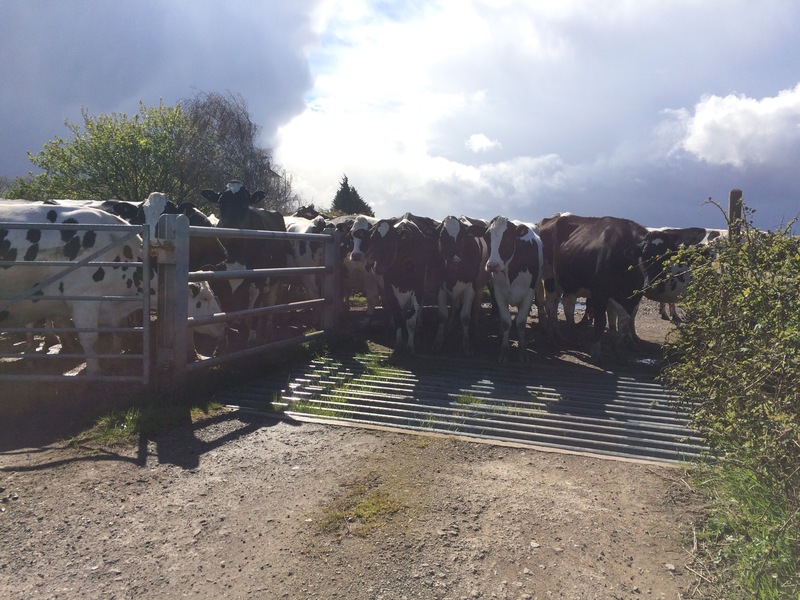 The next bit of the path was completely blocked by a herd of about 50 cows and a bull. Only one thing for it, I tried to look big and shoo them all away. Scary, but I managed it and then I walked very quickly around the path to get away from them. I arrived in the outskirts of Newport and survived my third shower standing behind a tree. I don’t think the path went through the best bits of town, at least I hope it didn’t. 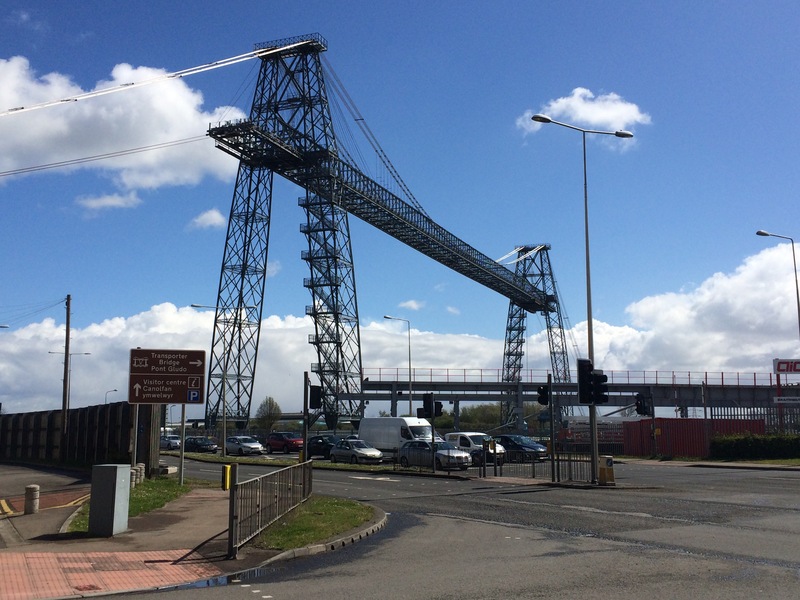 I arrived at the Newport Transporter Bridge and went into the small visitor centre. 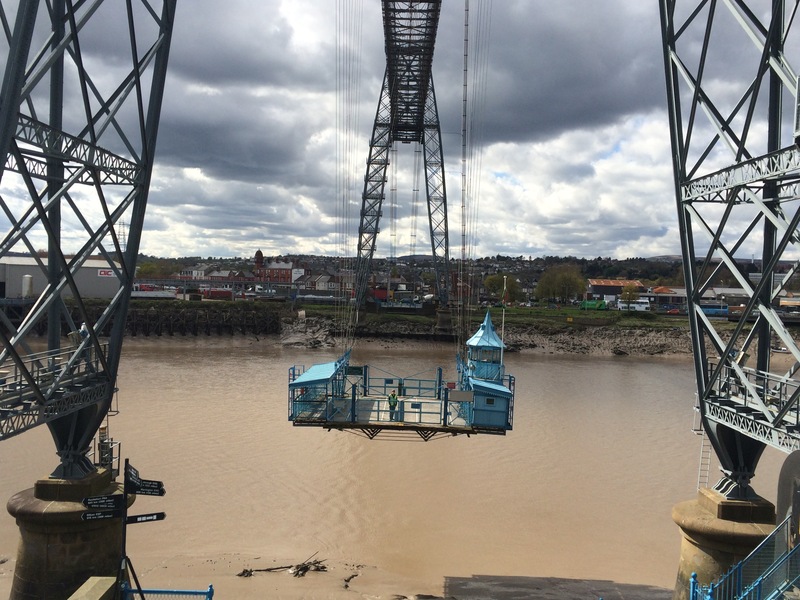 Having been on the Middlesborough Transporter Bridge already on my trip I was keen to go on this one, the only other working transporter bridge in the UK and one of only 6 worldwide (only 20 were ever built). 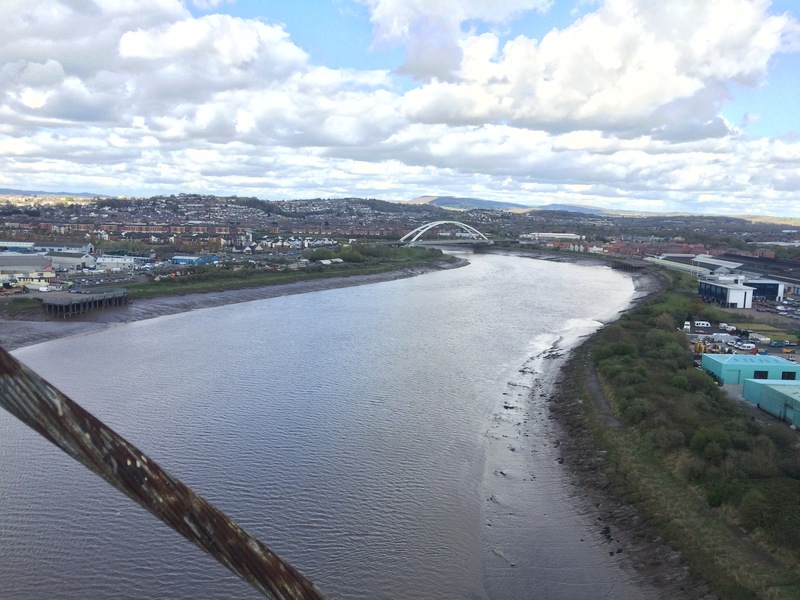 The Newport Bridge is even older than the Middlesborough one. It was built in 1906 and then restored and reopened in 1995. 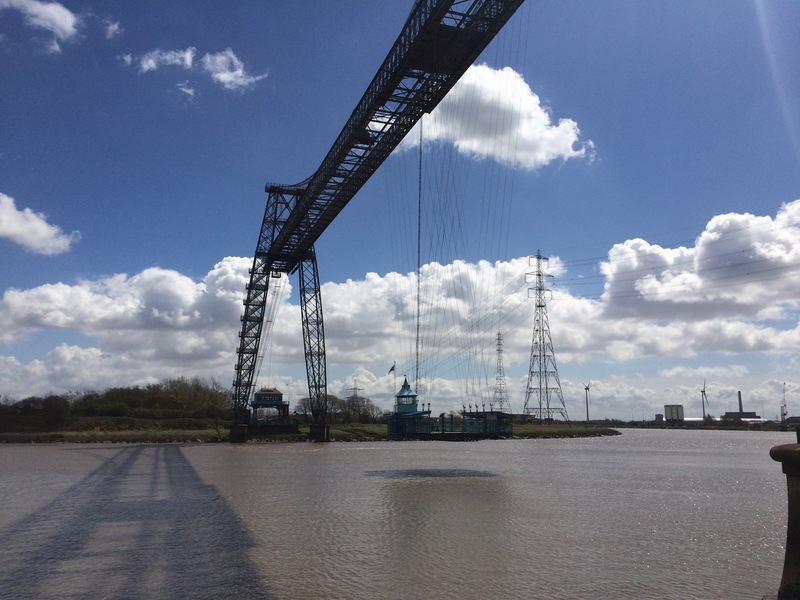 It crosses the River Usk and was built to ferry the workers to the steel plant. Before I crossed the bridge, first I was meeting Chris and Ginny for lunch at one of the old pubs next door, The Waterloo. It was great to catch up with Chris. 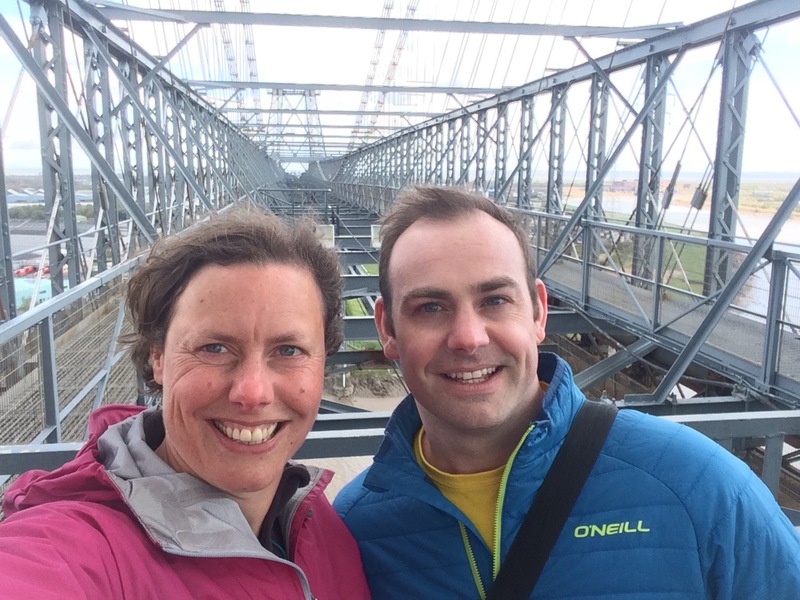 After lunch I met Oliver and we climbed up the Transporter Bridge together and walked across the top platform. 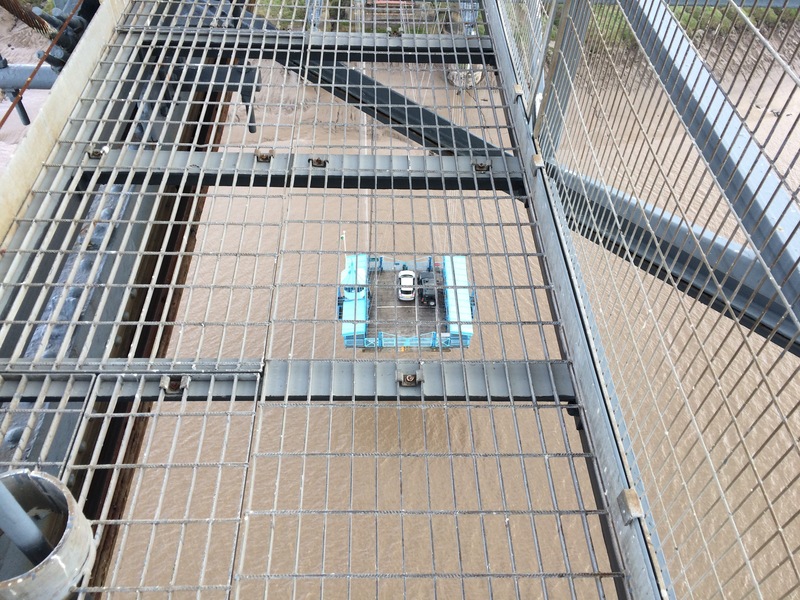 Once on the other side we caught the gondola back across the River Usk. We were lucky that the views were great this afternoon. Aaah, newport, lovely place! 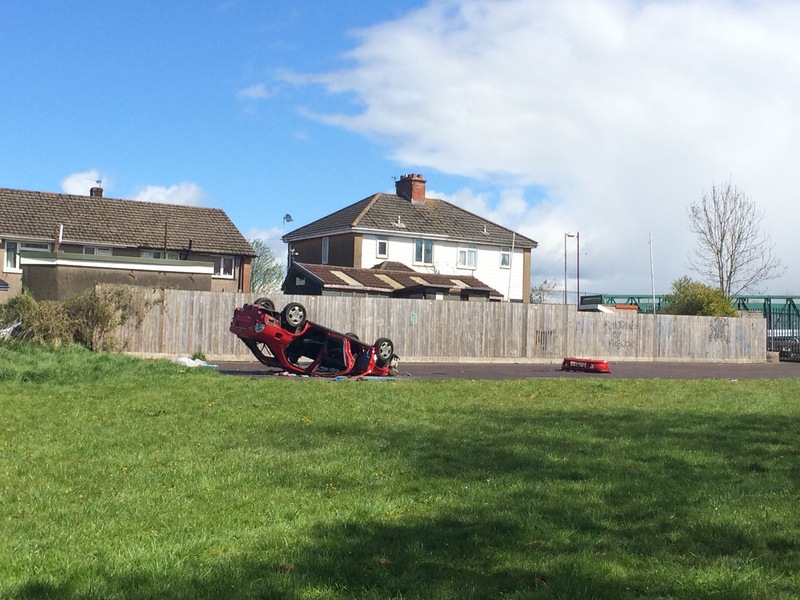 Your picture of the car reminded me of something I heard whilst at UWIC: the car thieves like to play snooker – first a red car, then a colour! handling it very well. Lovely photo of the “Newcombe Twins” keep on doing what you’re doing. Newport….uhhhhm classy place!!! If that car had been parked like that in some other city the wheels would have gone too. 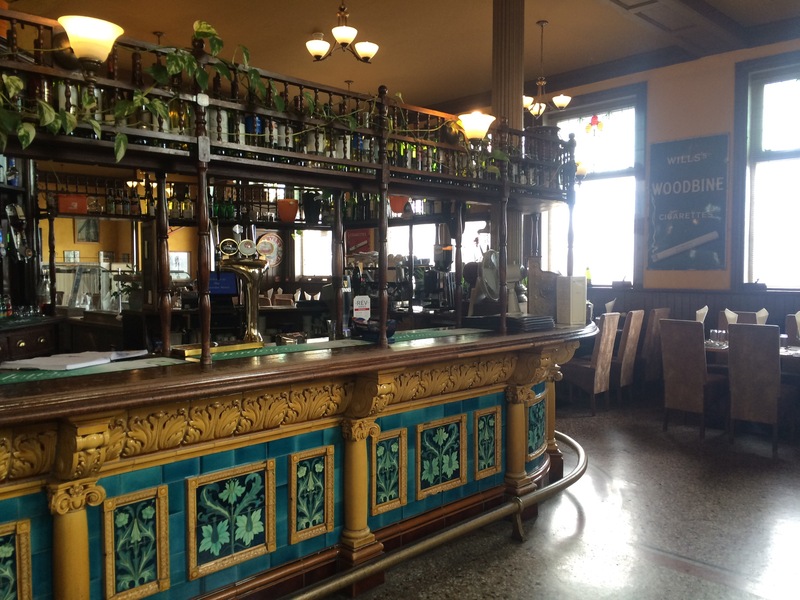 Lovely old pub with awesome company……..Tuesday can not come soon enough on on Juice you are doing brilliantly……….